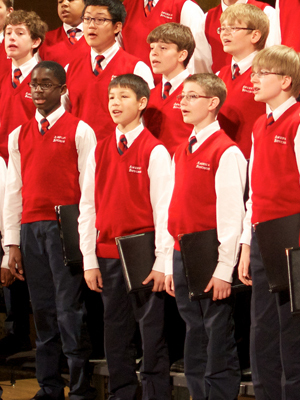 The American Boychoir appeared on Show 272, recorded in May 2013. The American Boychoir has long been recognized as one of the finest musical ensembles in the country. Capitalizing on its trademark blend of musical sophistication, spirited presentation, and ensemble virtuosity, The Boychoir performs regularly with world-class ensembles and internationally-renowned artists, and the list of collaborators reflects the extraordinary range of the ensemble: from great classical artists such as Jessye Norman and Frederica von Stade to jazz legend Wynton Marsalis and pop icons Beyonc and Sir Paul McCartney. TheyÕve also performed with The New York Philharmonic, The Philadelphia Orchestra, and The Boston Symphony, and have been featured with such illustrious conductors as James Levine, Charles Dutoit, and Alan Gilbert. The Boychoirs’ standing as preeminent ambassadors of American musical excellence is maintained through an extremely busy touring schedule both nationally and abroad and through frequent television and radio guest appearances. Its legacy is preserved through an extensive through an extensive recording catalog, which boasts over 45 commercial recordings and the launch of its own label, Albemarle Records. The choir’s most recent release, Journey On, was hailed by Fanfare magazine as “a fabulous recording, encompassing a remarkable range of music and styles, all of it performed with astonishing accuracy and lan, conveying at every turn a sense of discovery and an utter engagement with the music.” Boys in fourth through eighth grades come from across the country and around the world to pursue a rigorous musical and academic curriculum at The American Boychoir School in Princeton, New Jersey.